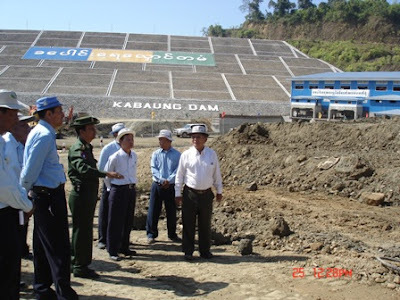 Minister for Electric Power No 1 Col Zaw Min, accompanied by Deputy Minister U Myo Myint and Director-General U Hoke Kyi of Hydropower Administration Department, went on an inspection tour of Khabaung Hydropower Project in Toungoo Township yesterday. At the briefing hall, Project Director U Maw Tha Htwe and Mechanical and Electrical Installation Director U Khin Maung Win presented reports to the minister on the project tasks and Deputy Minister U Myo Myint gave a supplementary report. After hearing the reports, the minister gave instructions on requirements of the project and inspected progress in building the power plant, installation of machines at the plant and stockpile of machinery. The minister looked into power control rooms and laying of underground cables, progress in building the switchyard, installation of porcelain balls, placing of concrete on steel pipelines, digging outlet canal of the power plant and dreding of Khabaung creek. The minister called for making efforts to complete the project tasks in time, carry out the tasks for proper flow in Khabaung creek, correctly install machinery at the power plant, perform greening tasks for the plant and its environs, grow shade trees and other crops, conserve natural beauties and forests and take preventive measures against the fire. Ninety per cent of Khabaung Hydropower Project has completed. Upon completion, the 30-megawatt installed power plant will generate average 120 million kwh yearly. This entry was posted on Tuesday, January 1st, 2008 at 6:38 am and is filed under ခေပါင္း (Khaboung). You can follow any responses to this entry through the RSS 2.0 feed. Both comments and pings are currently closed.